Every year I get assignments to photograph a number of different subjects and one area I really enjoy is photographing musicians. I wanted to post a couple of pictures I recently took on assignment for Yahoo country music of country singer Luke Bryan. He was passing through Seattle on tour after a gig at the Gorge and stopped off to go fly fishing with with his writing buddy, Jay Clementi, on Puget Sound at Seahurst Park in Burien. Here a couple of the pictures. In case you have not heard of Luke, his third album, “Tailgates and Tanlines” made its debut on August 9th as the number 1 album on Billboard’s country charts and as of today is still stuck there. Here are a few of my favorite pictures from the day. Luke was working with expert local fly fishing guide Dave McCoy from Emerald Water Anglers above in red jacket with Jay in the background. 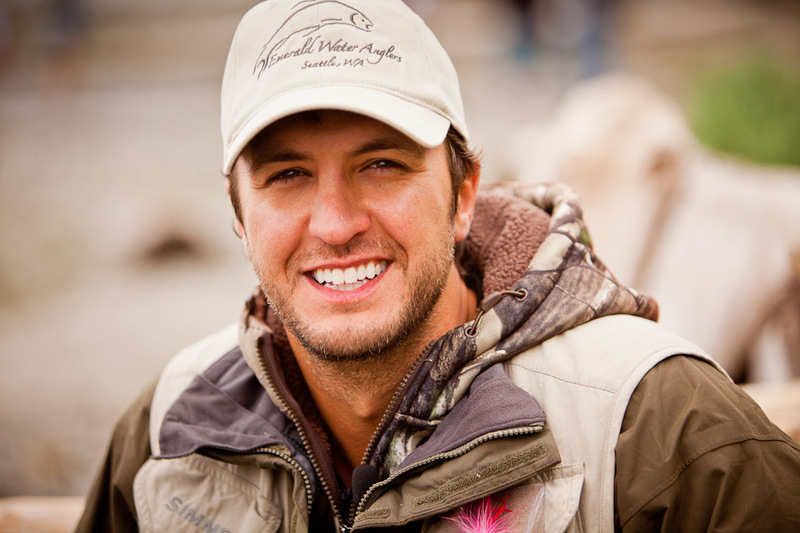 To watch the Luke Bryan episode of RAM Country TV, Click to watch Luke’s fly fishing video! This entry was posted on Sunday, August 28th, 2011 at 3:18 pm	and is filed under LIFE. You can follow any responses to this entry through the RSS 2.0 feed.